Converts a DVI-D Digital signal input to Analog PC/RGB or HD YPbPr output. It enables you to connect a digital DVI source to an analog PC monitor, projector or TV. Its high bandwidth capability supports a wide range of PC and HDTV resolutions. 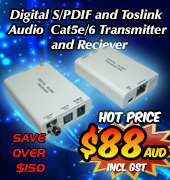 Digital S/PDIF and TosLink Audio over single Cat5e/6 Transmitter and Receiver is designed to transmit Optical and Coaxial digital audio signals up to 150 meters using one CAT5e/6 cable. The 720p Digital Multimedia Player handles display and playback of digital media including photos, music and movies, and can output these to a large size display with a resolution of up to 720p. The unit functions as a standalone device, allowing you to view content from a connected USB device or memory card. The 1080i Digital Photo and Music Media Player is a standalone device which allows you to view photos on your TV directly or listen to music from a memory card or USB device. 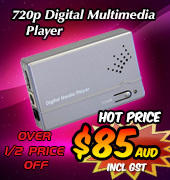 The 1080i Digital Photo and Music Media Player can output these to a large size display with a resolution of up to 1080i. The TruVolume HDMI v1.3 Volume Leveller is an audio repeater and decoder incorporating SRS TruVolume™ technology that will free you from volume fluctuations when switching TV channels. It is designed to regulate audio volume, allowing you to listen at your own comfortable audio level. It eliminates annoying volume fluctuations in television, music, and other audio sources. The unit also does signal amplification and equalization for repeater function. The YPbPr to DVI-I Format Converter is designed to convert an Analog YPbPr signal into a Digital DVI signal, enabling the User to connect the YPbPr (RGB) signal from a DVD player to the DVI input of a digital HDTV or display. HDMI over CAT5e/6/7 Transmitter with bidirectional PoC transmits uncompressed video and audio over a single pair of CAT5e/6/7 wires for a distance up to 60m. The new 4K2K HDMI Analyser and Enhancer is a tool designed for analysing HDMI HD and UHD 4K2K 6G video and audio signals. It can indicate the Bandwidth and HDCP details and allows for EDID and YUV420 selections. It can extend the signal up to a distance of ten metres and also allows users to upload EDID settings to a PC application, which can then be used to create alternative EDID settings for other specific uses. With direct selection keys for easy switching between modes and status LEDs which allow at-a-glance viewing of the device's status, the 4K2K HDMI Enhancer is a perfect tool for all professional Installers. HDMI 4k2k Repeater 1 In x 1 Out is an advanced solution for amplifying, equalising and extending an HDMI video and audio signal over an HDMI cable, for a distance up to 15 meters at 1080p@60Hz / 8-bit resolution. The higher the resolution of an HDMI signal, the less distance it will travel over an HDMI cable. The HDMI 4k2k Repeater 1 In x 1 Out overcomes distance issues and supports HD 1080p, UHD 4k2k and all 3D formats. The HDMI Repeater 1 In 1 Out with Audio Decoder is used to extend a HDMI signal for transmission over long distances. The audio decoder function allows you to take a HDMI input and output the audio via Optical (TOSlink) or LPCM 7.1/5.1/2 channel through the multi-channel output ports. The unit also supports compressed digital bitstream (Dolby TrueHD, Dolby Digital Plus, and DTS-HD Master Audio) through the input and output ports. The DVI Over CAT5 Transmitter allows a user to distribute a DVI signal over CAT5 cable. When used with a DVI Over CAT5 Receiver Box, this unit provides a great way to transmit and extend a DVI signal over a long distance (100-250metres depending on Receiver used). The HDMI v1.3 4 In 1 Out Switcher with CEC allows four HDMI sources to share one HDTV display and easily selects between the four sources, supporting a wide range of PC and HDTV resolutions from VGA to UXGA and 480i to 1080p, plus High Definition Dolby Digital True HD and DTS-HD audio. The HDMI v1.4 1 Input 4 Output 4Kx2K Splitter is a high performance splitter that supports 4K×2K (3840*2160), 3D, 12-bit Deep Color as well as High Definition Lossless Audio. The 4K2K and 3D over CAT5e/6/7 Wall-plate Receiver with 24V PoC is designed to receive uncompressed video, audio and IR control data from a compatible transmitter over a single pair of CAT5e/6/7 wires from a distance of up to 60 meters. The PC / Component Video Transmitter over Cat5 Cable transmits a Component signal to a Receiver unit over Category 5 cable, and is used to extend the overall Component signal distance. Depending on the type of receiver used with the transmitter, the Component signal can be extended for a distance of 50m to 100m. HDMI Switch 4 input - 2 output allows up to four HDMI devices to be connected to the unit so that you can easily switch between them for display on your HDTV. The unit can also output the HDMI Signal to two High Definition TV displays simultaneously. Used in conjunction with the DVI Over CAT5 Transmitter, the DVI Over CAT5 Receiver Box - 100 meters receives a DVI signal from the transmitter utilizing a Category 5 (CAT5) cable, and then outputs via DVI to your display. The device is used to extend the overall DVI signal distance by up to 100 meters without any signal loss or degradation. The Mini DisplayPort 1 In 3 Out Extender Splitter is used to split a high resolution image to 1, 2, or 3 Mini DisplayPort monitors. The device can determine the number of monitors connected and will transmit the correct signal for the display, displaying up to 1920*1200 resolution. Full HD compatibility provides full display performance with zero lag and no display limitations. The DisplayPort Extender Splitter 1 In 3 Out is a multi-taskers device, extending the signal from the display input for regeneration and splitting to three separate displays (which are SD compatible). The HDMI 8 In 1 Out Switcher allows for eight separate HDMI input devices to share one HDTV display. It allows you to easily switch between the eight input devices to select the desired input for display. Digital HDMI output devices such as Digital VCR / DVD / CVD / SCVD players, Set Top boxes, PS3 or Xbox360 Game Consoles or Converter units can easily be connected via HDMI cable. Used in conjunction with the HDMI Video Transmitter over Cat5 Cable, the HDMI Video Receiver over Cat5 Cable - 50m receives a HDMI signal from the transmitter utilising Category 5 cable and then re-transmits it to your HDTV display. The HDMI Video Receiver over Cat5 Cable - 50m is used to extend the overall HDMI signal distance by up to 50 metres. The 2D to 3D Media Box converter offers real-time conversion of Progressive Scan 2D content to 3D, so by using this device you can easily create a 3D video stream for display on your 3D capable HDTV. Instead of purchasing expensive 3D Blu Ray players, this device allows you to convert progressive 2D formats into 3D SBSH (Side-By-Side Half). Use the 2D to 3D Media Box and your 3D capable TV in Side By Side mode to display in 3D video content. The SDI-3G 1 In 4 Out Splitter is a device that allows SD/HD/3G SDI signal sources, such as a SDI video camera/recorder, to be displayed on up to four SDI displays, such as a SDI computer monitor or screen. The high bit rates (2.970 Gbit/s) allow for a faster signal transmission to prevent any loss of quality in the signal. The PC/HD to DVI Format Converter converts an analog VGA signal (such as from a PC) to a DVI-D digital signal. This allows you to connect the analog VGA output from a PC or Laptop computer to a digital monitor, TV or projector, resulting in a crystal clear digital image. The HDMI over CAT Cable Transmitter & Receiver Set w/ 48V PoE and OAR transmits uncompressed audio, video and IP data over a single run of CAT5e/6/7 cable up to a distance of 60m. The 1x2 HDMI over HDMI and CAT5e/6/7 Splitter with 24v PoC converts a single HDMI input, plus 2-way IR and RS-232 control, into a single CAT5e/6/7 output. An HDMI bypass output is also supported. The HDMI UHD 4k2k Audio Extractor is designed to de-embed the audio signal from an HDMI HD and UHD video/audio signal. The extracted audio signal can now be converted to an Analog Left / Right or Digital Optical audio signal for connection to an external sound system. If wanting to use the original HDMI audio signal, it simply passes-thru the converter and is contained in the HDMI video/audio signal output. The HDMI UHD 4k2k Audio Extractor supports HDMI High Definition video, all 3D video formats and 4k2k Ultra High Definition video using 3D and 4k2k enabled equipment. The HDMI 6G Audio Bridge with Pattern Generator is an advanced tool for generating 6G HDMI test signals for checking HDMI 4K2K UHD devices. With 6 settings covering Ultra HD (4K2K) and Full HD (1080p) resolutions, 4 test patterns, HDCP (1.4, 2.2, non-HDCP) and 3 audio types, all combine to provide over one hundred types of test patterns. The 4K UHD HDMI EDID Emulator is designed to manage and manipulate the EDID information provided by a connected HDMI source device. Extended Display Identification Data contain critical information about the capabilities of the connected HDMI display, including audio/video format support and HDMI features support. The HDBaseT HDMI over Single CAT5e/6/7 Transmitter with LAN/PoE/RS-232/IR can send uncompressed video, audio and IP data over a single run of CAT5e/6/7 cable, to a distance up to 100 metres. Added benefits include control through the built-in RS-232 and IR ports and a bidirectional LAN serving connection. Also, the transmitter is powered by the PoE function of the receiver, allowing for greater flexibility in installations. The HDBaseT HDMI over Single CAT5e/6/7 Transmitter with LAN/PoE/RS-232/IR is simple to instal and operate. ​The DVI-D Dual-link 1x4 Splitter allows a DVI-D signal to be split into four DVI-D Dual-link outputs. It accepts both Single-link and Dual-link DVI-D signals, with support for DVI PC resolutions up to WQXGA for Dual-link DVI-D and up to WUXGA@RB for Single-link DVI-D. The DVI-D Dual-link 1x4 Splitter allows users to connect one DVI-D source for dual-screen viewing. The DVI Over One CAT6 Extender allows a user to distribute a DVI-D signal over a single CAT6 cable. The unit supports high definition Input/Output up to WUXGA/1080p. The DVI over one CAT6 Extender can transmit a WUXGA/1080p 8 bit resolution signal up to a maximum of 64 meters, with a WUXGA/1080p 12 bit resolution able to be extended up to a maximum of 25 meters. The HDMI over CAT6 Transmitter and Receiver with IR and RS-232 transmits uncompressed video and audio signals over extended distances of up to 60m (1080p@50/60Hz) with no loss of quality in sound or visual. This device allows you to connect a HDMI source, such as a Blu-ray Player, and a RS-232 source, such as a computer hard drive, and transmit those signals through the Transmitter, which is connected to the Receiver via a CAT5e or CAT 6 cable over an extended distance (up to 60m) to a HDMI display source, such as a HDTV or projector. It also supports High Definition Audio and 3D signals, and the IR ports connected to both the Transmitter and Receiver allows the HDMI sources to be controlled via remote on both ends. The HDMI over CAT5e/6/7 Transmitter with 48V PoH transmits uncompressed audio/video and IP data over one single pair of a CAT5e/6/7 cable, for up to a distance of 60m. New HDMI UHD 4K2K Scaler designed to accept a High Definition 1080p@24Hz video signal and upscale it to Ultra High Definition 4K2K resolution, or take UHD 4K2K resolution and downscale it to HD 1080p@24Hz. Integrate High Definition and Ultra High Definition equipment using the HDMI UHD 4K2K Scaler. Twin HDMI outputs give you one HDMI 'scaled' port for signal change, while the 'bypass' port outputs an UHD 4K2K or HD 1080p@24Hz signal, dependent on the attached display. The HDMI v1.3 8 In 1 Out Switcher with CEC allows eight HDMI sources to share one HDTV display and users to easily switch between sources on one display. It also features CEC, RS-232, hand held remote control support, and a wide range of PC and HDTV resolutions from VGA to UXGA and 480i to 1080p are accepted. High Definition Dolby Digital True HD and DTS-HD audio is also supported. It is perfect for home theatre integration, advertising purposes, and showroom displays. The 4K UHD HDMI with Dolby® Digital/DTS® Stereo Audio Decoder supports the transmission of high bandwidth (18Gbps) video and allows the associated audio signal to be simultaneously extracted and split to both digital and analog audio outputs, providing high quality audio extraction and replay on external audio equipment. The HDMI over CAT5e/6/7 Transmitter with Bi-directional PoC (mountable) transmits uncompressed video/audio up to 4K2K and IP data over a single pair of CAT5e/6/7 wires, for a distance up to 100m. The HDMI over CAT5e/6/7 Receiver with Bi-directional PoC (mountable) receives uncompressed video/audio up to 4k2K and IP data over a single pair of CAT5e/6/7 wires, for a distance up to 100m. The HDMI 4 in 1 out 4k2k Switch allows one of four source HDMI signals to be selected and displayed on one common monitor. Input HDMI source equipment such as Blu-ray and DVD players, Set-Top-Box's and gaming consoles like XBox and PS3 and output to an HDMI TV/Display with HDMI cable. It supports the latest HDMI features such as Ultra HD 4k2k resolutions, all 3D Content, 36-bit Deep Color and High-definition lossless audio formats. It has the added benefit of control via IR remote control, RS-232, IP/Telnet and Web GUI. The HDMI to 3G SDI Single Output Converter allows HDMI sources such as Blu-ray Players or game consoles to be displayed on an SDI display and is useful for applications including smart home entertainment, smart building or any smart AV installation system and film studio display. Used in conjunction with the HDMI Video Transmitter over Cat5 Cable, the HDMI Video Receiver over Cat5 Cable - 150m receives a HDMI signal from the transmitter utilising Category 5 cable and then re-transmits it to your HDTV display. The HDMI Video Receiver over Cat5 Cable - 150m is used to extend the overall HDMI signal distance by up to 150 metres. 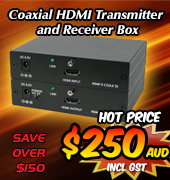 Coaxial HDMI Transmitter and Receiver Box for the transmission of HDMI Full HD over Coaxial cable, for up to 100 metres distance. Features support full HDMI v1.3 1080p 12bit Colour transmission, support Deep Colour, in-built CEC technology, support for HD Audio up to 7.1 Surround (8 channel audio). Transmission format ensures no delay or loss of Video and Audio signals over long distance and no software required for operation. The HDMI v1.4 4 In 1 Out Switcher - Wall Mountable is a high performance four HDMI input and one HDMI output switcher with digital audio inputs and outputs. The HDMI/Audio over CAT5e/6/7 Receiver with 48V PoH is designed to receive uncompressed UHD 4K video and audio over a single CAT5e/6/7 cable pair for a distance of up to 100m, without signal degredation. ​The HDMI over single CAT5e/6/7 Transmitter and Receiver set is designed to extend uncompressed audio/video and IP data over a single run of CAT5e/6/7 cable up to a distance of 100 meters. The 3G-SDI 4 In 2 Out Splitter/Switcher allows one of four input SD-SDI, HD-SDI and 3G-SDI signals to be shown on two SDI displays, while ensuring high bit rates of 2.970 Gbit/s, giving fast signal transmission time without signal loss. The HDMI to One CAT5e/CAT6 Cable with LAN/PoE/IR Receiver makes your home or office more efficient by sending an uncompressed video and audio HDMI signal, plus 3 Ethernet connections and Controls (through in-built RS-232 and IR ports), over a single CAT5e/CAT6 cable for a distance of up to 100m. The HDMI v1.3 1 In 4 Out with Multi-Channel Splitter is a high performance device which allows a single HDMI source to be duplicated four times and the new outputs connected to HDTV's, for multi-viewing purposes. Supports a wide range of PC and HDTV resolutions from VGA to UXGA and 480i to 1080p. The HDMI/Audio over CAT5e/6/7 Transmitter with 48V PoH is designed to transmit uncompressed UHD 4K video and audio over a single CAT5e/6/7 cable pair for a distance of up to 100m, without signal degredation. The HDMI and Audio over Single CAT5e/6/7 Receiver/Splitter is designed to receive an uncompressed audio and video signal over a single pair of CAT5e/6/7 wires, for a distance of up to 60m. This HDMI to HDMI HQV Scaler (CHQV-2H) is designed for the Blu-ray DVD players, Digital TV, Cable and Satellite Set-Top Box (STB), Internet Digital Media Adapters, Audio-Video Receivers and Digital Recorders markets. It gives you the freedom to enjoy the full benefits of high resolution video by recreating a cinema like experience in the comfort of your home. This device is a worthy addition to any home entertainment system. In addition, the HD inputs have been improved, allowing this Scaler Box to deliver crisp, stunning and noise free full HD video. New generation 1 Input 4 Output 4K2K HDMI 6G Splitter is an advanced solution for splitting and distributing a single HDMI signal simultaneously to 2, 4, 8 or 10 HDMI outputs. Apart from providing support for UHD video, up to 4K2K@60Hz (YUV444) resolution, it also supports audio pass-through of high resolution digital formats such as LPCM7.1CH, Dolby TrueHD, Dolby Digital Plus, DTS-HD Master Audio and Dolby Atmos with sampling rates up to 192kHz. The HDMI and USB over CAT5/6 TX/RX is a pair of devices that allow a HDMI and/or USB host device to send and save data up to 100 meters away over a CAT5/6 cable, while offering four USB port extensions to facilitate operation from the remote end. This means that you can connect a PC to the Transmit unit and then control the PC via a keyboard and mouse connected to the Receive unit at the remote end, up to 100m away. Fully compliant with HDMI v1.3, HDCP 1.1 and DVI 1.1 specifications. The device is ideal for remote PC, USB, and HDMI transmission. New 1 In 2 Out UHD 4K2K Splitter Scaler with Audio De-Embedding is designed to upscale a HD 1080p signal to a UHD 6G 4K2K signal, or downscale a UHD 6G 4K2K signal to a HD 1080p signal, with synchronized digital and analog audio output. 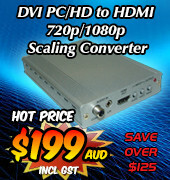 The DVI-I to Component (HD) Scaler Box is designed to upscale a DVI-I input source to a HD Component Video output. A wide range of selectable output resolutions are available, including 480p, 480i, 576p, 576i, 720p, 1080i and 1080p @ 50/60Hz. The HDMI to One CAT5e/CAT6 Cable with LAN/PoE/IR Transmitter makes your home or office more efficient by sending an uncompressed video and audio HDMI signal, plus 3 Ethernet connections and Controls (through in-built RS-232 and IR ports), over a single CAT5e/CAT6 cable for a distance of up to 100m. The 3G-SDI 1 In 2 Out Splitter Scaler allows SD-SDI, HD-SDI and 3G-SDI signals to be split into two identical SDI outputs. The identical outputs can be scaled up or down to any other SDI resolution and can provide bandwidth up to 2.970 Gbps for 3G-SDI video support. The easy to access and use OSD menu allows for simple User interfacing and management of the 3G-SDI 1 In 2 Out Splitter Scaler functions. This 4K video and audio extender set is a multi-function video over IP extension solution with support for up to 4K UHD signal transmission. This transmitter and receiver pair is ideal for any household or commercial environment. The 16 Way HDMI Female to Female Couplers Patch Panel (CPP-16H) cross-connects (patches) HDMI inputs to HDMI outputs of source and sink products, such as game consoles, set-top boxes, Blu-Ray/DVD Players, Laptops, PC's and HDTV's. This HDBaseT HDMI and Audio over CAT5e/6/7 Receiver/Splitter can receive uncompressed audio/video and data over a single run of CAT5e/6/7 cable, from a transmitter up to 100m distance. The added benefit are the dual simultaneous HDMI outputs with audio de-embedding, to a balanced analog or a digital coaxial audio output. It has 2 bidirectional LAN serving connections, allowing devices such as Smart TVs or games consoles to share an Internet connection and an in-built Power over Cable (PoC) function allows for remote power supply from compatible transmitters. The HDMI v1.4 4 In 2 Out Switch is a high performance device with 3D support. It allows up to four HDMI sources to be displayed on two HDMI display panels. Supports HDCP repeater functions and all standard 3D TV formats in addition to all HDTV formats up to 1080p 12-bit Deep Color. Supports PAL and NTSC video formats and includes remote control for easy operation. This HDMI/VGA over CAT5e/6/7 Extender is multi-function transmitter and receiver set that supports the transmission of ultra high-definition signals (up to 4K2K@30Hz, YUV444). This system is an ideal solution for any household and/or commercial environments. The compact yet versatile HDMI/VGA to HDMI 6G Scaler accepts a wide range of resolutions from 480i up to 1080p/WUXGA for PC/HD and up to 4K@60Hz (4:4:4) for HDMI, with the ability to scale the output to a selectable resolution up to 4K@60Hz (4:4:4) and with simultaneous de-embedded, digital and analog audio output. The HDMI v1.4 1 Input 8 Output 4Kx2K Splitter is a high performance splitter that supports 4K×2K (3840*2160), 3D, 3 Gbps bandwidth, 12-bit Deep Color, as well as High Definition Audio. The latest UHD 4x2 4K2K Switch with 6G capability allows a customer to route up to four 6G HDMI input signals to any of two 6G HDMI outputs. New generation 1 Input 8 Output 4K2K HDMI 6G Splitter is an advanced solution for splitting and distributing a single HDMI signal simultaneously to 2, 4, 8 or 10 HDMI outputs. The SDI to PC/HD Scaler with Audio allows SDI, HD and 3G-SDI signals to be displayed on HD/PC displays. Ideal for professionals who work with HD/PC displays, this scaler automatically detects your SDI source while giving you high bit rates of 2.970Gb/s, 2.970/1.001Gb/s, 1.485Gb/s, 1.485/1.001Gb/s and 270Mb/s without signal loss, while also distributing and extending SDI signals over long ranges (3G-100m, HD-200m, SD-300m). The new UHD 6G Matrix 4in 2out HDCP 2.2 allows you to select any one of four video signal sources and display them to two new generation 6G UHD TV's. Alternately, display one of the inputs to one of the TV's and display another input to the other TV. It supports 4K2K, 48-bit Deep Color, Hi-Def audio, HDCP 2.2 and other features defined by HDMI specifications. The HDMI v1.4 4x2 Matrix 4k2k allows an HDMI signal from any one of its four sources to be displayed on any one of its two connected HDMI monitors. Display one source HDMI signal to one or both connected HDMI monitors. With 'fast-switching' technology, the HDMI v1.4 4x2 Matrix 4k2k supports HD 1080p@50/60Hz, UHD 4k2k, all 3D formats, Deep Colour and HD lossless audio formats. The HDMI v1.3 4 In 4 Out Matrix Selector provides an excellent solution for connecting multiple HDMI devices and displays together by connecting four HDMI devices for display to four High Definition monitors. You can use any combination of input to output, giving you up to 16 display scenarios. ​The new HDMI 4 In 4 Out Matrix w/4k2k support on output D (4) allows HDMI signals from any four connected sources to be routed to any one of the four connected HDMI monitors. Display each one of the four source signals to an individual monitor, or display one source signal to all four monitors. There are many display scenarios that the HDMI 4 In 4 Out Matrix w/4k2k can be configured to handle, with support for 3D video, 48-bit Deep Colour and 4k2k on channel D only, plus Hi-Def lossless audio. The HDMI over CAT5e/6/7 Wall Plate Transmitter and Receiver w/ 48V PoH set can send uncompressed audio/video along with controls, IP and USB data over a single run of CAT5e/6/7 cable up to 100m. This HDMI to HDBaseT Scaler with Audio Output transmits uncompressed audio/video, along with Control, Ethernet and extra audio data, over a single run of Cat.5e/6/7 cable up to 100m. The 4 by 1 HDMI UHD Switcher allows four HDMI sources to be routed to an HDMI display. The Fast Switching Technology greatly reduces the time required to swap between inputs. The Control System provides direct control and also indirect control interfaces, for all your connected devices. Supporting traditional direct control systems like IR, Relay and DC. Indirect control systems include IR Learning, RS-232, Telnet/Web GUI controls. All this allows the user with PC or APP based control systems greater flexibility over devices. The HDMI/Audio over CAT Cable Transmitter w/ 48V PoH is a great solution for extending uncompressed HD audio and video, as well as Ethernet and control, via a single run of Cat.5e/6/7 cable over distances of up to 100m. The HDMI v1.4 4x4 Matrix 4k2k allows an HDMI signal from any one of its four sources to be displayed on any one of its four connected HDMI monitors. Display one source HDMI signal to one, two, three or four connected HDMI monitors, or display each HDMI source signal to one HDMI monitor each. With 'fast-switching' technology, the HDMI v1.4 4x4 Matrix 4k2k supports HD 1080p@50/60Hz, UHD 4k2k, all 3D formats, Deep Colour and HD lossless audio formats. The HDMI over CAT Cable Wall Plate Transmitter w/ 48V PoH is designed to transmit uncompressed UHD video and audio to a compatible Receiver over a single Cat5e/6/7 cable, for a distance up to 100m. The 4x4 HDMI UHD 4K Matrix combines, switches and connects an HDMI signal from any of its four video sources to any of its four connected HDMI displays. This allows any one of the four source signals to be shown independently on any one of the four displays, or all four simultaneously. The HDMI v1.3 1 In 8 Out 2D-3D Splitter is designed to duplicate one HDMI video/audio signal into eight equal HDMI video/audio signals, for display on up to eight High Definition LCD or Plasma displays using HDMI cable up to a distance of 15 metres. The HDMI v1.4 Over Single CAT5e/CAT6 is a convenient way to extend a HDMI signal over a long distance. Instead of using expensive HDMI cables, this unit distributes the HDMI signal over a Cat5e/Cat6 cable. This high performance device supports HDMI v1.4 signals, including 3D content and 4k x 2k signal resolution, as well as 7.1CH, Dolby TrueHD, and DTS-HD audio support. The 4x4 UHD 6G Matrix with HDCP 2.2 is designed to support the next generation of Ultra High Definition 4K2K audio and video. It can switch any one of four HDMI v2.0 sources to any of one of four HDMI v2.0 displays, with many combinations available. The Modular Matrix 8*HDMI output enables the connection of up to 8 HDMI displays to the modular matrix. The HDBaseT-Lite 1x4 HDMI over CAT5e/6/7 Transmitter-Splitter is designed to transmit three streams of Full HD 1080p, 3D, and 4Kx2K video and audio signals up to a distance of 60m over three separate CAT5e/6/7 cable runs. An HDMI local output allows you to check the source signal using a display at the originating end. Also supports the transmission of multi-channel digital audio formats such as LPCM7.1, Dolby TrueHD, Dolby Digital Plus and DTS-HD Master Audio (32-192kHz sample rate). The 10 input × 2 output HDMI UHD Matrix with Fast Switching is an advanced solution for switching any one of 10 HDMI inputs to two HDMI outputs in various display modes. New generation 1 Input 10 Output 4K2K HDMI 6G Splitter is an advanced solution for splitting and distributing a single HDMI signal simultaneously to 2, 4, 8 or 10 HDMI outputs. Apart from providing support for UHD video, up to 4K2K@60Hz (YUV444) resolution, it also supports audio pass-through of high resolution digital formats such as LPCM7.1CH, Dolby TrueHD, Dolby Digital Plus, DTS-HD Master Audio and Dolby Atmos with sampling rates up to 192kHz. The HDMI v1.3 4 In 4 Out Matrix Box provides an excellent solution for connecting multiple HDMI devices and displays together, connecting four HDMI sources to four High Definition displays in any combination, giving you up to 16 display scenarios. Ideal for use in Professional, Academic fields and Private Home theatres. The HDBaset HDMI over CAT Cable Transmitter with ARC and 48V PoE can send an uncompressed HDMI video and audio signal, along with Controls, IP and USB data, over a single CAT5e/6/7 cable for a distance up to 100m (328ft). It has in-built control tools like RS-232 PC protocol and Infra-Red signalling, plus the ability to supply 48vDC power (PoE) to the remote receiver via the CAT cable. Extras include an Audio Return Channel facility and separate audio ports for outputting digital & analog audio signals. The HDMI v1.3 4 In 2 Out Matrix provides an excellent solution for connecting multiple HDMI devices and displays together. Up to four HDMI devices can be connected to the unit for display on up to 2 High Definition displays. You can use any combination of input to output, giving you up to 8 display scenarios. This is ideal for use in Professional and Academic fields or Private Home theatres. The HDMI over Single CAT5e/6/7 Wall-plate Transmitter and Receiver set can send uncompressed video, audio and IP data over a single run of CAT5e/6/7 cable up to a distance of 100 meters. New release Multi Video over CAT6/7 HDBaseT UHD+ Scaler Transmitter is used with its Receiver, ID#15517 to transmit Ultra High Definition+ HDMI, DisplayPort and PC VGA video and audio signals up to a distance of 70m over one single pair of a CAT6/7 cable. The HDMI 6 In 2 Out 4k2k Matrix allows any two of six HDMI source signals to be routed and displayed onto two connected HDMI displays in Matrix-Mode. Two extra viewing modes, View-All-Mode and Picture-In-Picture-Mode, lets you preview all the connected HDMI signals on the two displays at the same time. With fast switching technology, the device greatly eliminates the time required to start viewing when swapping or turning ON/OFF the connected displays. It supports 4k2k UHD, 3D, 12-bit Deep Color, Hi-Def lossless audio and other features defined by HDMI specifications. The 6 in 2 out HDMI UHD Matrix HDCP2.2 with Fast Switch Technology allows an HDMI signal from one of 6 connected sources to be routed to and displayed on its 2 connected HDMI displays, with support from View All Mode and a Picture-in-picture (PIP) features. With in-built 'fast-switch' technology the device can greatly eliminate the time required by swapping or turning ON/OFF the connected displays. It supports 4K2K, 3D, 30-bit Deep Color, Hi-Def audio and other features defined by HDMI specifications. The management of source/sink scenarios can be operated easily through on-panel buttons, IR remote control, RS-232 or Ethernet protocol. The HDMI and IP Over Single CAT6 Extender is designed to allow you to extend one HDMI signal, as well as three Ethernet signals (IP), over a long distance. Instead of using expensive HDMI cables, this unit distributes the HDMI/IP signals over a single Cat6 cable using imbedded HDBaseT Extender technology. New release Multi Video over CAT6/7 HDBaseT UHD+ Scaler Receiver is used with its Transmitter, ID#15516 to receive Ultra High Definition+ HDMI, DisplayPort and PC VGA video and audio signals up to a distance of 70m over one single pair of a CAT6/7 cable. The HDMI over HDBaseT Wall-plate Transmitter & Receiver Set w/ LAN, IR, RS-232,PoH transmits uncompressed, high resolution video and audio over a single CAT5e/6/7 cable, up to a distance of 100 meters. The HDMI over HDBaseT Wall-plate Extender Set w/ LAN, IR, RS-232,PoH transmits uncompressed, high resolution, video/audio over a single CAT5e/6/7 cable, up to a distance of 100 meters. The HDBaseT HDMI over Single CAT5e/6/7 Transmitter and Receiver (with LAN/PoE/RS-232/IR) can transmit an uncompressed Video and Audio signal, plus IP data over a single run of CAT5e/6/7 cable up to a distance of 100 meters. It has the added benefit of control through in-built RS-232 and IR ports and a bi-directional Ethernet connection adds value for extending LAN networks. The remotely located Receiver can be powered by the Power over Ethernet (PoE 48V) function from the transmitter, allowing for greater flexibility in design and installation. The Bi-directional Infrared IR 8x8 Matrix is designed to work alongside the 8×8 HDMI matrix, providing control of up to 8 source devices from up to 8 display locations. Using the original or programmable remote controls, source devices such as DVD/Blu-ray players or satellite/set-top boxes can be controlled from any location. New 6 input 2 output 4K UHD HDMI Matrix with 6G Capability connects and switches six (6) 4K UHD HDMI signals between two (2) 4K UHD HDMI displays. The HDMI v1.3 Over CAT6 Distributor 1 In 8 Out allows a CAT6 source to be split and duplicated onto 8 different HDMI outputs. It is intended to be used with a HDMI to CAT6 transmitter unit (eg ID#743 or ID#542), and allows a user to distribute the source signal up to 40 meters away. The HDBaseT HDMI and Audio over CAT5e/6/7 Cable with 48v POE is designed to send and receive uncompressed video and audio signals together with control, IP and USB data, all over a single run of CAT5e/6/7 cable of up to 100m in length. The system has the added benefit of in-built User control via RS-232 and IR ports and it has a bi-directional LAN connection allowing for extension of USB functions to the receiver end. There is also a bi-directional digital audio capability that gives users the convenience to transmit audio from either end of the system. The HDBaseT HDMI over CAT5e/6/7 Extender with 48V PoE is designed to send and receive uncompressed video and audio signals together with RS-232 and IR control signals all over a single run of CAT5e/6/7 cable of up to 100m in length. The system has the added benefit of in-built User control via RS-232 and IR ports. This HDMI/DisplayPort/VGA to HDMI Scaler with HDBaseT Output is designed to switch and scale up to 5 AV inputs to simultaneous HDMI and HDBaseT outputs at resolutions up to 1080p & WUXGA. The HDBaseT HDMI UHD Receiver and Scaler is designed to extend and scale an HDMI or HDBaseT™ video and audio signal into two HDMI UHD outputs, with separate analog audio output. It supports the latest HDMI and UHD resolutions such as 4K2K, 3D, 36-bit 'Deep Color', plus Hi-Definition lossless audio and other HDMI v1.4 features. Management of source and sink (HDTV) is achieved by on-panel buttons, OSD menu, IR Remote controller and PC based RS-232 and WebGUI/Telnet control. The new HDBaseT-Lite 1x8 HDMI over CAT5e/6/7 Transmitter-Splitter up to 4K2K supports Full HD 1080p, 4K2K timing, 3D and multi-channel digital audio formats for transmission over 7 separate single CAT5e/6/7 cables for a distance up to 60m. A local HDMI output allows for display of the video signal at the transmitter end. Fully compatible with PAL and NTSC video systems. New 4 SDI Input to 2 HDMI Output Switcher with Multi-view PiP is a high performance seamless switch that incorporates an easily configurable high speed zooming/shrinking system for control of quad or picture-in-picture video processing and display. The 4 HDMI to 4 CAT/2 HDMI Out Video Audio Matrix 40m supports routing and transmission of video (resolutions up to 4K@60Hz w/ HDMI 2.0 & HDCP 2.2) and audio (multi-channel digital/stereo analog) while providing flexible control via IR, RS-232, Telnet or WebGUI. HDBaseT-Lite 8 Port CAT Cable Module (3Play Convergence) is designed to be used with Modularised Hybrid Matrix's for connection of 8 independent CAT5e/6/7 signal transmission cables. Each transmission cable can carry High Definition PC and Video signals from VGA to WUXGA and 480i/p to 1080i/p, plus Audio signals like LPCM 2Ch to 7.1CH, Dolby TrueHD, Digital Plus and DTS-HD Master Audio up to a distance of 70 metres, without signal loss or degradation. The Video Wall 1 x 4 HDMI 4K UHD Splitter allows an HDMI 4K2K source video signal to be transmitted as four individual video displays onto four LCD/LED monitors. Alternately, you can make one big 'Video Wall' displaying a single video source by using all four monitors combined and operating as one big screen. An in-built "Bezel Correction" function allows the displayed image to be taken to the very edges of the four video monitors. The 4 x 4 HDMI 4K UHD over CAT5e/6/7 Matrix supports the transmission of video and multichannel digital audio from four high definition sources to four HDBaseT™ outputs, each system over a single CAT5e/6/7 cable. Maximum transmission distance is 60m for 1080p HD signals and 35m for UHD 4K2K signals.